Not only is this a beginner's project, but turning pens and in particular the slimline pen is now the avenue for a lot of woodworkers to becoming woodturners. There is something fascinating about making a pen and having it work that appeals to many people. 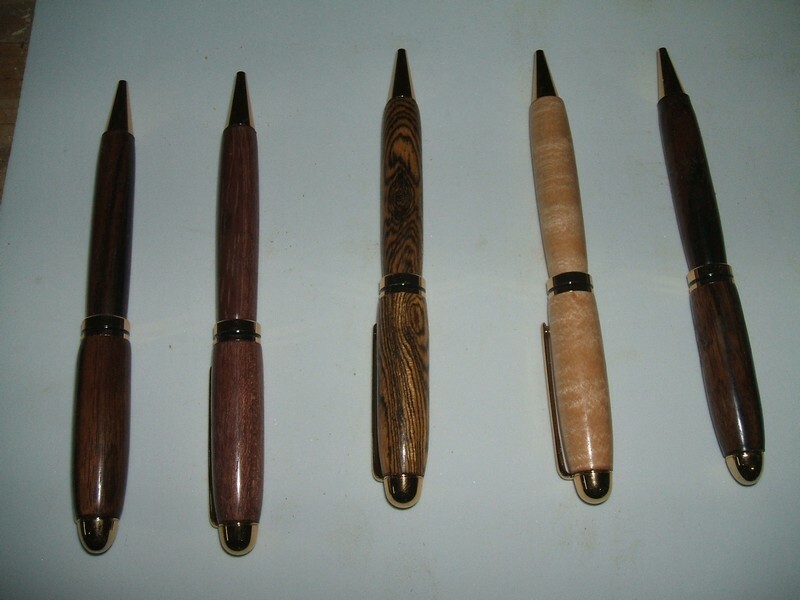 In addition, woodturning is a new skill to enter the woodworkerk's shop and there is really only a bit of turning but a lot of other shop skills in making a pen. People have been after me for ages to put up a page on it so come and take a look. Comments are welcome and already I see a need for explanation on a couple of jigs and such. I turned this piece a while ago and set it on the "carving to be done later" shelf but decided to post it as I think it has some good stuff in it. In order to save a piece of cracked cherry I needed to change what I had in mind for design and found it needed to be a thin walled vase. To do so I had to use a light as a thickness gauge for the sides, not always easy in dry, figured fruit wood. It was a lot of fun. I think if I was to do it over I would change the base a lot, but that is always design food for another day at the wood lathe. Just to be honest, I have no idea if this was up before or not. While I was rewriting the site I came across this set of pictures for an apple hollow form I turned and sold a little while ago. The wood was questionable but gorgeous. It was a small log of apple that a friend gave me. 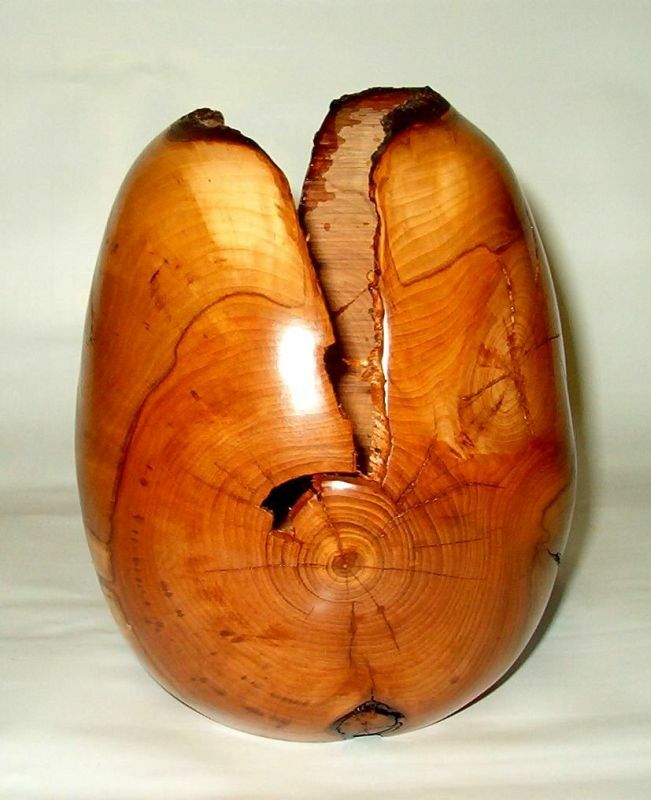 The log has been drying for a few years with no end seal treatment and was cracked deeply. Like a lot of fruit wood it had twists, turns, defects and scars. In other words it should have been firewood but was too god for it. The condition of the wood made it more of an advanced project than an intermediate and to be honest, I thought more than once it was going to disintegrate on me. Nice stuff and the kind of wood that makes turning fun. One of the things that I have been trying to do as I rewrite the sight pages is gather some of the information into a more coherent form, both for me at the back end and for you as you read the material. It has also opened up a lot of things that I need to cover. Look for them in the future. Some time ago I put some videos up on YouTube dealing with some aspects of turning wood, in particular about turning bowls. 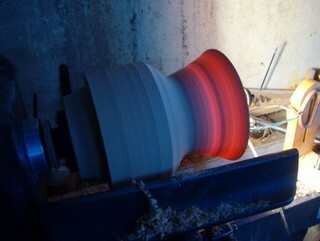 I have added a page to the bowl series linking to those videos in order and I hope they help. I still think the pictures and explanation work as well but the two together give a pretty good picture of how I do the work. This is still fun. Lately I have been asked about pen turning and I turned a European or Mont Blanc™ style pen and took pictures and videos. 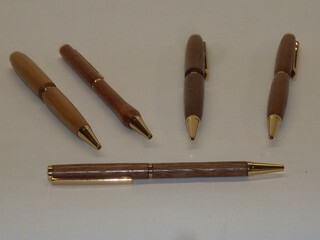 Eventually I will expand the project to include some other kinds of pens and the jigs I use to turn them. One of these days I have to make a blank vise for automatically centering the blank at the drill press. I will let you know when it happens. By the way, I consider turning pens like the slim line and European and their relatives a beginner project so feel free to jump right in. I knew this day was coming. Some years back before the net, or if you are young the "world wide web" was little more than a few static sites and some bulletin board type communications through dial-up connections, I got a question on a user group about woodturning. Really, I can not recall what the question was although the group was rec.crafts.woodturning. When I tried to answer the question my answer was not clear. However, I had a digital camera, my ISP was allowing some web space free to any customer who wanted to use it, and HTML looked like fun so I put up a web page with pictures and sure enough someone else asked a question. aroundthewoods.com was born and became a lot of fun. Somehow this thing just grew. I kept turning and taking pictures and started making tools and going to craft shows and so on. Unfortunately it grew like Topsy. Pages got put hither and yon, mostly in the main section of my hosting account which quickly outgrew the ISP space and I got some from Godaddy and registered aroundthewoods.com and kept adding. HTML changed and CSS adapted and the site is written in old code that the browsers do not like. All that preamble means I have to rewrite the site to make it easier for me and hopefully you. Wish me well. In the meantime the gardening season is about over (It is fall in Nova Scotia ) and woodturning is calling out to me. I am learning HTML5 and CSS3 and pages are being rewritten. Also I have moved hosting accounts on Godaddy with a few glitches along the way. Mostly things will go on the same for familiar users of the site. Some things will be easier but bookmarks may have to be updated. Please keep in touch and be patient. This is a learning experience for me and they are usually hard work. In the meantime, God bless, safe turning, and keep making shavings.